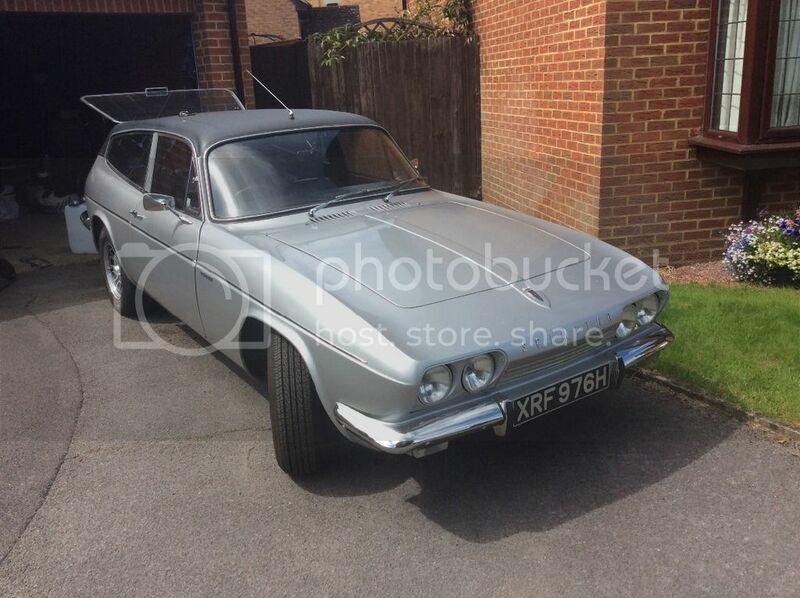 After finally accepting my days of major projects are over for the time being; my quest to find a much less ambitious Scimitar project came to nothing in the summer, and I'd given up hope of something suitable turning up..
Then I was having a look on here and this turned up.. It took me around the time it took to press the PM button to decide I wanted it and luckily I was first in the queue! So a drive down to Surrey was planned for yesterday, and I now have the car sat in my garage..
All in all the car is even better than described by Roy, and his honest description of the paint work was spot on. 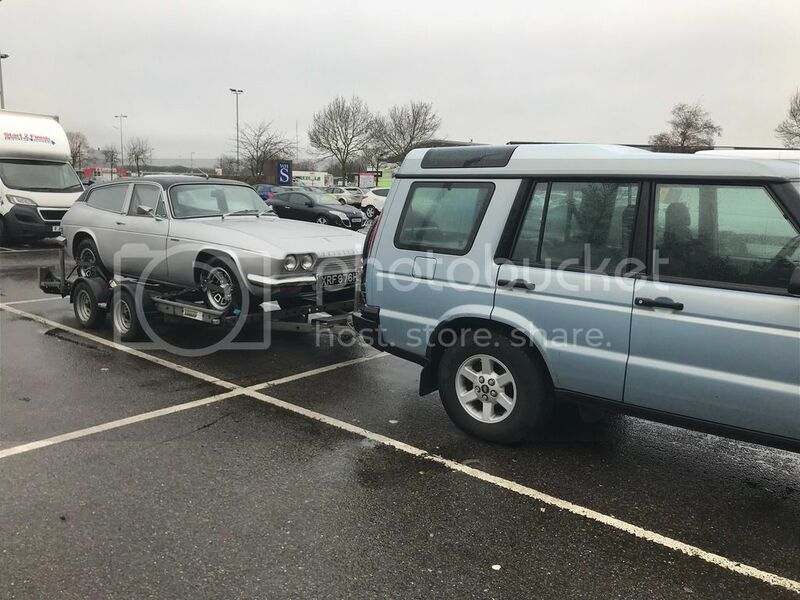 It was nice to sit in a road spec car, and I was really surprised how excited I was just driving it onto the trailer My intention is to carry on improving the car and return it back to it's original look minus the vinyl roof.. I need to get it insured so I can have a go in it now!! Congratulations, It's a lovely car with a great history!! You decided agianst the trip on the train to collect it then! 2nd for loosing the vinyl roof and going back to original. Well done Paul, it's a great car. I agree about the vinyl roof. I am okay with the roof. If it were me I would not be in any hurry to change it. Only when it came time for a re-spray would I consider removal. It will only be removed when it gets painted Steve..
Every option be it plane/train or a combination of the two took way longer than just nicking my Dads Disco (because I have nothing with a tow bar at the moment), and fetching it with the trailer... So that's what I did..
Looks very smart, I love reading about cars that have had an interesting past. Looking forward to hering more! I've had chance to have a good look around the car and it's actually better than I expected! The car's had a body off chassis restoration done maybe 20+ years ago and it still looks good with most of the paint still intact around the rear of the chassis and axle. The car has all the stainless bits (tank, exhausts, headers, water pipes) and the engine was fully rebuilt with some nice upgrades a few years ago. All the bushes are excellent and mostly recent, the dampers are Gaz fixed seat adjustables. The front suspension looks good and needs nothing other than a quick clean and some paint here and there. Under the bonnet is very tidy with an uprated fan, electric fuel pump, Bosch dizzy, 38 DGMS carb, K&N filter element and no rot whatsoever in the front metal work and support cross member. The interior is very presentable with chrome ringed dials and a Moto-Lita wheel and needs no immediate attention really. So it does just need a general tidy up here and there and painting and that's not as bad as I first thought. Well done! What a great looking car. It looks fantastic, especially in silver. I'm another one who'd vote for loosing the vinyl roof and returning it to standard. Cheers, and there is no voting necessary the vinyl is going!